Mictlantecuhtli was one of the most important deities of the Aztec pantheon. The Underworld had a very important place in Aztec mythology and it was believed that people descended to the underworld after their death. This underworld of Aztec mythology comprised of different levels. Mictlantecuhtli occupied the lowest level among these and was the deity most closely identified with death. Although Aztecs had many other gods and goddesses related to the underworld, Mictlantecuhtli was probably the most important underworld god for them. Mictlantecuhtli is one of the most ancient gods in the Aztec pantheon and figures prominently in the Aztec creation mythology. According to the mythology, he had been charged with overlooking the underworld and the bones of the gods in the underworld since time immemorial. In different representations of Mictlantecuhtli, he is depicted as a human figure with his hands wrapped around his knees and looking ahead, as if waiting for someone. This probably depicts Mictlantecuhtli waiting for the dead to reach the underworld. According to Aztec mythology, Mictlantecuhtli and his wife were made gods of the underworld after Quetzalcoatl created the world. Later when the world was destroyed again and gods needed to create mankind once more, they asked Quetzalcoatl to steal the bones of old gods from the underworld. When Quetzalcoatl attempted to steal their bones, Mictlantecuhtli tried to stop him. Failing that, he forced Quetzalcoatl to drop and break the bones. Quetzalcoatl still carried them back to the living gods who turned these bones into different races of mankind. This was how mankind in the current cycle of the Sun was created, according to the mythology. Different depictions of Mictlantecuhtli exist in the extant Aztec sources. These sources include Aztec art, such as ceramics and statues, and Aztec books called codices. 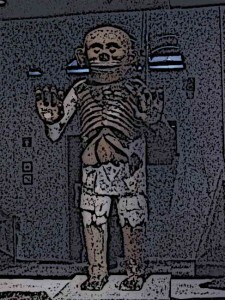 In these sources, Mictlantecuhtli is often depicted as a human-like skeletal figure with blood stains, or with a big-teethed jaw. In some depictions, a skull replaces his head even though the skull contains eyes. Some Aztec sources claim that Mictlantecuhtli wore human eyeballs around his neck and wore a huge headdress plumed with colourful feathers. He is usually shown as a fear-inspiring god who is identified with death, which may explain his fearful countenance. 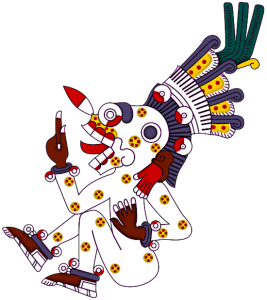 In some instances in Aztec codices, Mictlantecuhtli is shown as a deity with arms raised aggressively. This is meant to depict Mictlantecuhtli waiting for the dead to arrive so that he can tear them apart as they enter the underworld. Mictlantecuhtli had a fearful countenance and was often depicted with symbolism using skeletons. He was considered the most powerful god of the underworld who dealt severely with the dead who entered his realm. Aztecs believed that the Earth aged in cycles of the Sun and each cycle culminated in the destruction of mankind. The first four cycles of the Sun ended in mankind’s complete ruin. In the fifth cycle, Quetzalcoatl was charged by the gods to sneak into the underworld and steal the bones of the previous generation of the gods. When Quetzalcoatl tried to do so, he was hampered in his attempt by Mictlantecuhtli. The bones Quetzalcoatl was trying to steal broke in the process. Originally, gods had planned to create mankind equal but with broken bones, they created different kinds of men and various races. This is how, Aztecs believed, mankind came into being during the fifth cycle of the Sun which is the current cycle. Mictlantecuhtli is associated with death but the symbols surrounding him also offer a different meaning. In Aztec mythology, skeletal figures are also intended to mean fertility and health. This is because in Aztec belief system, life and death are related very closely to each other, and each augments the other. Seen in this context, Mictlantecuhtli is not just the god of death and underworld but also a deity related to fertility and health of the Aztec society. It was also attributed to him that he received the stars into his jaw ever morning. Aztecs believed that stars tried to defeat the Sun and the Moon but that the Sun defeated them each morning. So it is possible that the Aztecs believed Mictlantecuhtli to receive the dead objects from the heavens. Mictlantecuhtli is associated with a wide assortment of objects in Aztec mythology. He is, for example, associated with owls, bats and spiders. He is also associated with North. Aztecs believed that he had control over all three types of souls that they thought existed. These included souls of people who died heroic deaths, those who died normal deaths and those who died non-heroic deaths. Most Aztec deities had control over one kind of souls but Mictlantecuhtli’s control over all three types shows that the Aztec believed him to be a very powerful deity. A number of Aztec deities appeared in the Aztec calendar where each day was denoted by certain symbols. Mictlantecuhtli was deemed the god of the day which bore the sign of a dog. Aztecs believed that all those who were born on the 6th day of the 13th week received their souls from Mictlantecuhtli. He was also placed in the list of Aztec Night Gods. In Aztec calendrics, Mictlantecuhtli is associated with darkness, night, death and the opposite of light and happiness. He is the complimentary deity coupled with Tonatiuh in the Aztec calendar, where Tonatiuh represents light and Mictlantecuhtli represents darkness. Mictlantecuhtli was one of the most powerful deities in the Aztec pantheon. He was considered the god of the lowest portion of the underworld who exerted most control over the realm of the dead. In Aztec mythology and symbolism, he was associated with night, death and darkness. He is often depicted in Aztec art as a human-like figure with a bony jaw and at times a skeletal head with bulging eyes. In Aztec creation mythology, Mictlantecuhtli hampered the creation of mankind during the fifth cycle of the sun but failed to stop Quetzalcoatl.